No Point of Sale workstation is complete without peripheral hardware. We carry all of the POS hardware you need and each piece is guaranteed to be compatible with your Booklog client computers. Why use our hardware? A printer is a printer, right? While we won’t require you to purchase hardware through us, it is to your advantage to use the recommended hardware. All changes and new features are rigorously tested on the recommended hardware before release. Booklog technical support is trained to support the recommended hardware specifically. That means that when you call support about your printer, you get an expert on that brand and model of device. We keep test units of all recommended hardware on hand to make troubleshooting easier. We have long standing relationships with our vendors ensuring quality in both equipment and service. 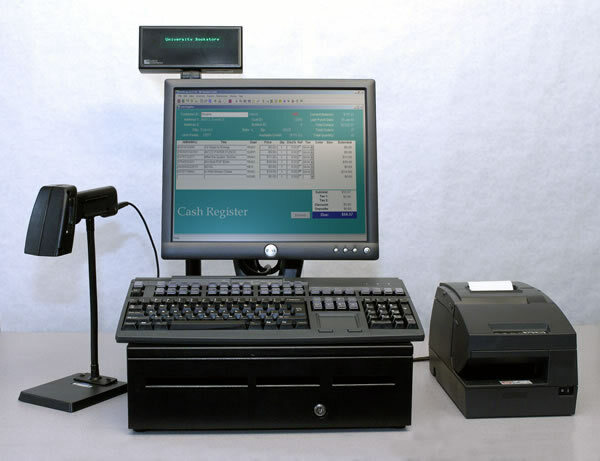 For your convenience, we offer all of the supplies that you might need for your peripheral POS hardware including printer ribbons, receipt tape, and barcode labels. Booklog is designed to run on any Windows computer that meets the minimum specifications so we do not require that you purchase special computers from us. However, we are a Dell reseller and can assist with your purchase by providing a quote of recommended server and client computers.